Point Pleasant senior Allison Henderson hits full stride during the 2018 Skyline Bowling Invitational varsity girls race held at Gallia Academy High School on Oct. 2 in Centenary, Ohio. Point Pleasant sophomore Kyelar Morrow sprints toward the finish line during the 2018 Skyline Bowling Invitational varsity girls race held at Gallia Academy High School on Oct. 2 in Centenary, Ohio. MINERAL WELLS, W.Va. — Hoping that the third time ends up a charm. 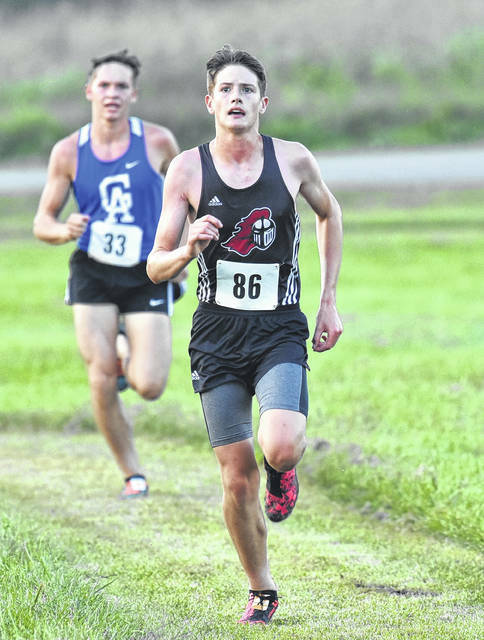 Point Pleasant senior Luke Wilson is headed to the state cross country meet for a third consecutive postseason after placing third overall at the 2018 Class AA-A Region IV championships held Thursday in Wood County. Wilson — the school’s all-time record-holder in cross country — will have one last shot at competing with the state’s best next Saturday at Cabell Midland High School after posting a third place effort of 16:31.4 at regionals. 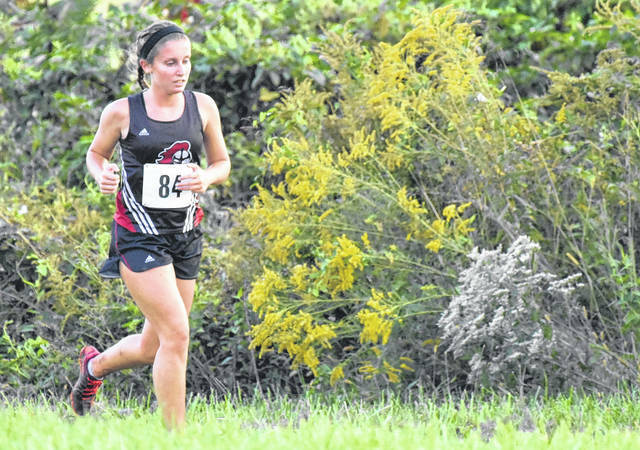 Wilson, however, is the only member of the PPHS cross country program moving as the Lady Knights were fifth and the Black Knights were sixth in their respective competitions. The top two AA-level and A-level programs advanced as teams in each race, and Point Pleasant ended up being the third team in Class AA in both events. Aaron Withrow of Winfield won the AA boys race, defeating the 78-competitor field with a winning mark of 15:57.1. Bryce Jarrell of Ravenswood was the runner-up with a time of 16:29.4. The top 16 individuals ended up qualifying for state as well. Ethan Scott followed Wilson with a 23rd place time of 19:23.0, while Kyelar Morrow (21:16.9) and Isaac Daniels (21:20.7) were respectively 44th and 45th. Tanner Durst (22:18.2) completed the team tally by placing 55th overall. Luke Derenberger (23:30.3) was also 60th for the Black Knights. Winfield won the Class AA-A title with 29 points, while Ravenswood (50), Williamstown (114) and Nitro (116) rounding out the top four spots. Wirt County was also fifth overall with 122 points. There were six teams and 60 participants that took part in the Class AA-A girls event, which allowed two single-A and two double-A teams to advance out — as well as a dozen individual qualifiers. Winfield won the regional crown with 28 points, while Williamstown (43), Wayne (82) and Buffalo (115) also earned state berths. The Lady Knights were fifth overall with 123 points, finishing well ahead of sixth place Wirt County (169). Allison Henderson led the PPHS girls with a 17th place effort of 21:44.1, followed by Isabella Sang (23:33.1) and Naomi Meisser (25:26.3) with respective finishes of 27th and 36th. Ava Yonker (25:29.2) and Mai Pederson (26:15.5) completed the team tally by placing 37th and 44th. Amber Hatfield (26:15.7) and Sophie Viebrock (26:21.6) were also 45th and 46th overall for the Lady Knights. Ella Hesson of Williamstown won the girls individual title with a time of 19:19.2. Baylee Adkins of Winfield was the overall runner-up with a mark of 19:34.5. Both races consisted of 16 competing schools. Visit runwv.com for complete results of the 2018 Class AA-A Region IV cross country championships held in Mineral Wells.